Interview conducted by Joshua Elder. Politics and superheroes are a potent, yet potentially explosive mix. Just ask Joe Kelly. 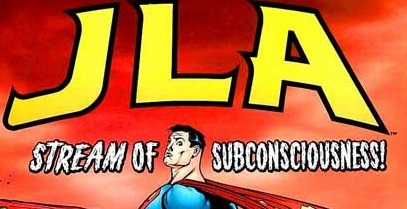 His most recent issue of JLA (#83) has aroused some powerful partisan passions on the part of conservatives (myself among them) who take exception to his allegorical tale about the build-up to Operation: Iraqi Freedom where Lex Luthor stands in for President Bush and Superman chooses to oppose the war. The issue in question has been hotly debated on online message boards and chat rooms, but one important voice has been missing: that of Kelly himself. So I caught up with the affable Man of Action to get his take on the controversy and find out the reasoning behind this volatile comic. Joshua Elder: The last several issues of JLA have had definite political overtones. The Kanjar Ro story with its allusions to the situation in Iraq, the psuedo-Waco showdown with Axis Amerika and finally JLA #83, a very explicit parallel for the Iraqi conflict. Why did you choose to go in this direction? Joe Kelly: It’s a combination of two elements – One, those issues were on my mind when I wrote those stories, so they naturally permeated the work. I guess the real answer is more the second one – I think that comics are a much more powerful medium than people imagine, and in certain circumstances, it’s appropriate to use them to discuss political issues. As a general rule, when I do that sort of thing, I try to keep it in the appropriate context. A JLA story is still a JLA story, whether there are overtones or not. Elder: I completely agree. I may disagree with the politics on The Authority, for example, but I still thought the book was terrific. Elder: But writing political stories using icons like Superman, Batman and Wonder Woman opens a big can of worms. Aren’t you afraid that by having these characters take hard political stances you might alienate a section of the fanbase? Kelly: Well, I think that one of the weaknesses of “iconic” characters is that they oftentimes lose the energy that made them icons to begin with as they become corporatized and regarded as franchises… Batman is a better character when he’s pushed to the borders of insanity and treated as a proper vigilante than when he’s geared to sell underoos. Superman is probably the most unique in the “political icons” regard. Elder: How so? 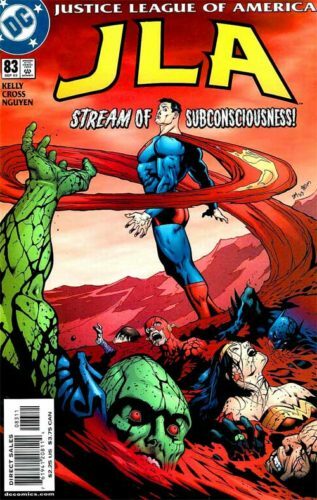 What do you think are the defining political characteristics of Superman? Kelly: Literally, the word “America” is integral to both the JLA (duh) and Superman’s mythos (… the American Way). As a writer, you have the choice to ignore that or embrace it. naturally, “embracing it” has a lot to do with what you believe “America” stands for… So in the case of Superman, for example, I believe that he believes in an idealized America. One that operates above boards, truly does embrace diversity, and cares for its downtrodden, but not because he’s naive, but because it IS possible. I don’t think he’s a dopey, kneejerk liberal, but rather has thought it through, and believes that when people are treated with respect and given a chance, they can thrive. Does that make sense so far? Elder: Sure. It’s exactly how I think he believes, too. Kelly: I think he believes that all people should be held to a standard, and that there is an objective “right and wrong.” When an issue falls into subjective “right and wrong,” I think he does his damnedest to do the right thing, and make a decision that he can live with. I don’t know if I’m giving you a proper “political definition,” probably more of a moral definition of the character, but with Superman, I think they’re very closely linked. As to how I personally feel, I believe in all of the same moral issues, but believe that the reality of America is a challenge to that morality. Elder: Now to move things more specifically to JLA #83 — a lot of the criticism of this issue has revolved around its obvious allegorical nature and how the reader is supposed to draw parallels between Presidents Bush and Luthor. You may not agree with all his policies, but isn’t a bit over the top to compare the president to a supervillain? Kelly: Heh, sure, let me just take you back to the genesis of that issue… I think I wrote that issue in January or February… It was when all of the UN stuff was happening, and we had not yet gone to war. I bring that up only to put the issue in a context. My frame of mind when I wrote it was the same as Superman’s. I didn’t know WHAT to think, because I was personally torn. I know Saddam is a bad guy and believed that he needed to be deposed, but I wasn’t convinced that war at that time was the appropriate move. Elder: I think a lot of people were that way. I supported the war but only after a lot of soul searching. It’s not a decision one comes to lightly. Kelly: So when I sat down to write #83, I was really attempting to struggle with the issue of not knowing. How do you take a stand when you don’t know the whole story? (Editor Mike) Carlin and I discussed the political stuff quite a bit, and since, ultimately, the story for me was about Superman’s choice, we thought it was appropriate. Elder: But isn’t that dangerous? That events in the real world could move so fast that they could overtake you by the time the story sees print? Kelly: Absolutely! And in a lot of ways it shows my state of mind, because I honestly didn’t think we were going in. Naive, for sure, but I can be dumb like that. Elder: If we find WMDs in Iraq – and after we’ve already found the mass graves filled with dead children — aren’t you afraid that Superman may end up on the wrong side of history? Elder: Isn’t a story like this really impossible to do fairly with Luthor in the DCU’s White House? Won’t anything that Luthor says (i.e. parroting Bush’s position on the war) become automatically suspect? Kelly: You’re right. I could have made a faceless president, though that would have been worse in some ways. Luthor represents duplicity to Superman, so to keep it personal, it makes the most sense to use him. Elder: Perhaps, but doesn’t that obscure the political aspects of your tale? This is clearly more than just another Luthor vs. Superman tale. Throwing Luthor in the mix muddies the water and makes Superman’s decision significantly less than impartial. Kelly: Practically, Luthor is our DCU president. So we’re stuck with him, for good or bad. But, from my personal point of view, I think it’s fair to say that there are a large number of folks out there, myself included, who do not fully trust Bush. So having Luthor in the White House, creatively, reflects how I feel when I sit down to write. Now it’s completely true that this is a one way medium, I’m aware of that… No one gets to shout their opinion in the middle of my story… But I’m not an “impartial teacher,” either. In #83 I have Superman say that he won’t be made to feel unAmerican because he wants the truth. I think a lot of folks felt that way, so it was important to me to have that voice heard. Elder: I think we all deserve the truth, and have no trouble with Superman or anyone else asking for it. I really like the idea of Superman, who does believe in America and the system, being forced to confront how the system (through Luthor’s election) can be corrupted and deceived. In this story, however, the parallels between Bush and Luthor were so obvious that all I and a lot of other readers could see was a pretty nasty shot at the president. BUT… At the time this was written, I was angry. I felt that the world community was being disregarded and insulted by the president. I felt that the American public was being handed a bunch of nonsense to justify a military action that was in many ways appropriate, just to speed up a timetable. I felt that the media was handling coverage of the issues with complete condescension and pandering to the White House, and ultimately, America as a nation was not being wholly represented. Elder: I understand your feelings and don’t deny that they deserve a voice, but don’t you think that’s a little disingenuous to use Superman as a mouthpiece for them? The last time Superman dealt with Qurac during the time of the first Gulf War, he destroyed their entire military. Kelly: Though I admit my own politics are in that story, I was honestly trying to write about Superman’s indecision, primarily. There is a certain level of “ambush” when you do a story like this. People aren’t expecting a helping of politics with their Superheroes, but I don’t think it’s inappropriate to do it. If it gets people angry, I think that’s great because that gets people talking. Discourse and debate are the only way these issues are ever dealt with. I welcome disagreement, especially when it’s well thought and put out in public. Elder: Doesn’t a story like this, that polarizes people and arouses strong emotions, especially with a character that — no offense — is bigger than you or any other single comic creator, need to be written with some distance from the actual event so that you’re leading with your head and not your heart? Also, I will point out that this story is in JLA, NOT Superman. There’s a reason for that. Though he’s the focal point of this story, it’s the Justice League of America who must ultimately deal with the politics of their namesake. Elder: How about this, then: If it turns out that Bush was telling the truth about everything, would you be willing to write a JLA story where Superman essentially apologizes or at least concedes the point? Kelly: I just remembered that you mentioned in your e-mail about people being upset about this “being a dream,” but that’s part of the story, isn’t it? If ultimately, the story is about Superman’s confusion and the lack of tact in the diplomatic arena at the hands of our government during that time, then no, there’s nothing to apologize for. It’s a document of the time. Superman’s struggling. Superman’s struggle in this story is a struggle of faith. He’s worked up a nightmare scenario in his subconscious, and in the end, the only answer he gets is that it’s all right to question the government, and he shouldn’t be made to feel ashamed for asking questions. Whether or not I ultimately achieved what I set out to accomplish, my hope was NOT to answer whether or not Luthor/Bush is telling the truth or doing the right thing, but focus on how Superman is made to feel when he doesn’t just fall in line. Imagine if I told the story where Superman goes in and find NOTHING. Imagine if I told the story where he goes in and finds tons and tons of Nukes. Elder: Good point. But when Superman says that Luthor “killed all that we stood for”, that seems like a pretty powerful political statement. Elder: While a lot of people may have disagreed with Pres. Bush’s decision, more than 70 percent of Americans supported it. And the only voice that 70 percent had was Lex Luthor. Kelly: That’s true. Like I said before, I wasn’t laying out a news report. It’s not my job to present all sides of a story if polarizing it makes for a more provocative take on the issue. Elder: I’ll agree that it’s more provocative, but you’re an excellent writer and I think you could have made your point without weighting the odds so heavily in your favor. Kelly: Well, again, “my favor” was supposed to be confusing the hell out of Superman. Putting him in an emotionally troublesome place. Elder: To be honest, this issue really upset me since I found myself agreeing with Luthor over Superman – right up until he killed Big Blue with kryptonite, that is. I can see where Superman is coming from and felt a lot of his angst myself, but I feel that Saddam had to be removed. That even without all the facts we knew enough to justify our actions. And I think that liberating Iraq was the morally correct thing to do. Kelly: Believe it or not, I do understand that you can’t reveal everything to the press about espionage “just because.” And I completely agree that Saddam needed to go. But what I don’t believe is the cost we have endured as America – not the financial cost, but the cost to our credibility and diplomatic standing in the world. Elder: That’s a good point, and one that WW makes. But I also believe think that those problems were already there and any crisis would have brought them to the surface. Nor do I believe it really hurt our credibility or diplomatic standing. The French government is putting together a giant ad campaign to woo Americans back to the country since their tourism industry has suffered so greatly due to their actions concerning Iraq. The Germans are trying to mend bridges, Iran is on the verge of revolution and North Korea has agreed to multi-lateral talks. I would argue that we’ve actually gained bargaining power and status in the world since the Iraq invasion. But they’re not America. I honestly believe that there is a higher standard of conduct that we should aspire to and INSPIRE others to follow, and getting our way just because we can isn’t what America is about in my eyes. Scaring our adversaries into compliance does not build a better world down the road. It engenders resentment and, again, in my opinion, creates the foundation for future conflict. Elder: Two final questions One: Why wasn’t the case for humanitarian intervention made in #83? I think we can all agree that our intervention in the Balkans was a good thing, though we deposed a legitimate leader in the midst of a civil war. What makes the Iraq/Qurac situation different? Saddam attempted genocide before and would have slaughtered the Kurds if it weren’t for the no-fly zone. Kelly: Honestly, that wasn’t pertinent to the story in this case. Even in the real world, no one has ever debated whether or not Saddam was a bad man, it was always taken for granted that Iraq needed cleaning up. Elder: But if we didn’t act, then who would? Saddam ahd been playing the international community for over a decade. What was the other option for deposing him? It seems like the JLA was arguing for maintaining the generally-accepted-to-be-evil status quo. Kelly: In terms of #83, it’s not passing the buck to point out that this wasn’t the JLA acting as themselves. It was Superman’s nightmare. The situation you’re posing they face was a lot more like the Kanjar Ro story, and they DID go pro-active, because they felt they had to. BUT, that had ramifications – they had to get into bed with, and ultimately outsmart Kanjar Ro. If #83 was meant to answer that question, it would have been a different story. Elder: Fair enough. Okay, last question: How do you respond to critics who call this is a partisan attack on the Bush administration and a hijacking of the Superman character to make your own political point? Kelly: Heh… That’s pretty heavy. The reason I wanted to talk with you today was that I appreciate the fact that this isn’t the typical JLA story. I don’t think it would be right for me to lay down a political POV and then hide afterward. Elder: And I respect you for that. You’ve taken a lot of risks with the book and that’s commendable. Kelly: Thanks… As far as a partisan attack on Bush… At the time that #83 was written, which was weeks before we went to war, I did want to make my voice heard. I did not think it was going to necessarily be the “popular” voice, but I thought it was important to share my sense of confusion and anguish. Clearly, there wouldn’t have been any anguish if I fully believed in the president and the case for war. I stand by my assertion that this story is much more about indecision and feeling persecuted for questioning the government than a direct slam on Bush, but I acknowledge that that stuff is there as well. As to hijacking the character of Superman, I certainly gave a lot of thought to the issue before I wrote the story, and while I’m sure it was a surprise to some readers to get this sort of story ESPECIALLY after the war was over, I don’t think it was an inappropriate story. I think that having Superman struggle with issues of truth, loyalty, and ultimately his own conscience in a politically complex world is completely on target for an American icon. Elder: I imagine a lot different. But I want to say thank you for granting me this interview. I appreciate you taking the time to discuss this and to directly answer your critics. And I look forward to seeing how you take this political bent onto Justice League Elite. Do you have any other projects coming up that we should know about? Kelly: JL Elite is primarily a morality tale about good guys who have to wallow in the filth, but still maintain their integrity. I’m sure some political stuff will sneak in, but it’s more like an undercover cop show than anything else. I’m writing a book called Enginehead with Ted McKeever, and that’s a fun, strange new character who’s created to fix the “flaws” in the universe. I want to ask you, I’ve never really tried to “defend” my work like this… How was it? Elder: But now that I understand the thinking behind it, I’m far more forgiving. Heck, I’ll probably have to go back and re-read it just to get my brain around it again. And I hope this interview will do the same for everyone else out in the comic book ether who reacted like I did. Kelly: I appreciate that. The only thing I honestly feel bad about is the timing of the issue. Your point about knowing how long an issue takes to see print is completely legit, but all the same, I do think it helps for people to know when it was done. Thanks again for the discussion – it really made my day!